Law department leaders want to use metrics but often struggle with knowing what is most critical to measure and how to harness the full power of metrics. Corporate law departments are hungry to demonstrate their value to the organization. They want to make faster, more effective decisions on ways to reduce costs, better manage budgets, avoid risk, and improve their processes. And they want best practice guidance on the key performance indicators (KPIs) and metrics they should be tracking to optimize performance. It’s more than just an adage – if achievement of law department objectives isn’t being measured, managing to those objectives won’t happen. Establishing a disciplined process to tie metrics to objectives is essential. A comprehensive KPI program points to areas that need improvement and helps establish a path to correct wayward trends. Effective programs incorporate measurement, review, analysis, goal setting, and accountability into a routine process. 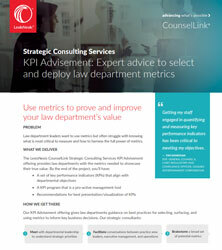 In addition to providing a proactive management tool, KPIs and other metrics – when shared with stakeholders outside of the legal department – demonstrate the ways the department is being efficient, saving money and minimizing exposure for the organization, thereby showcasing the legal department’s value. The Strategic Consulting Group helps corporate legal departments advance operationally by advising on process improvement, use of data, metrics and analytics, and change management. Take advantage of the expert guidance of our team by calling to discuss your needs today.